Anna Petrova was born in St. Petersburg. 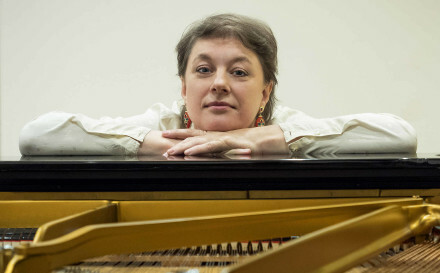 She began piano lessons at age six in Sofia. She started performing in public at an early age and after obtaining her teaching diploma with honours she obtained her concert diploma in the class of Prof. Ljuba Entcheva at the Sofia Academy of Music. Later she entered the master class of Louis Hiltbrand at the Geneva Conservatory, where she remained until his death. She obtained her soloist’s diploma in the class of Hubert Harry, Lucerne Conservatory. Anna Petrova performs widely as soloist and chamber musician. Concert tours of “Music of Lockenhaus” have taken her during the past years to New York, Chicago, and the Far East. With the “Chamber Orchestra of Europe” she has played in Vienna with Gidon Kremer and Tatiana Grindenko, and they have toured Italy. She has also appeared on radio and television broadcasts. Note: This short autobiography is also available in the following languages: French, German.